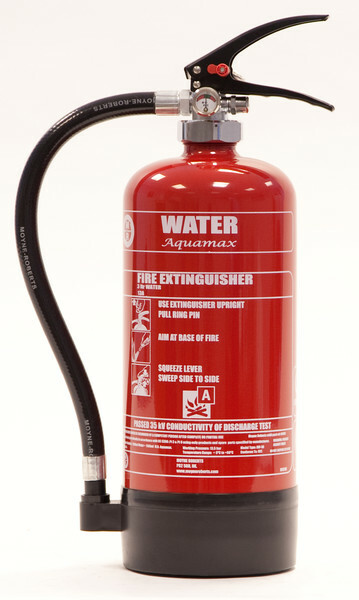 Aquamax water plus additive extinguishers are some of the highest rated units on the market in Europe at present, a unique mix of the Aquamax additive and the Moyne spray nozzle has led to exceptional fire ratings. Aquamax is environmentaly friendly and non corrosive. 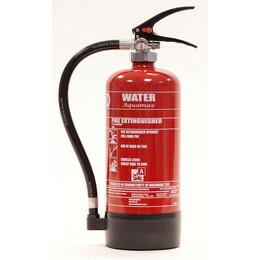 Our 3litre , 6 litre and 9 litre water extinguishers are manufactured in accordance with the current BS EN3 standards in a quality assured environment to ISO 9001 which is subject to continuous independent auditing. As proof of compliance every water extinguisher carries the BSI Kitemark and they are in conformance with the European Pressure Equipment Directive 97/23/EC. Passed the 35kv conductivity of discharge test. Squeeze grip design for enhanced discharge control. Internal PE lining up to sealing point, no internal threads exposed to liquids to stop corrosion. Large diameter neck rings for easy inspection. Full epoxy polyester coated steel shell for high corrosion protection.